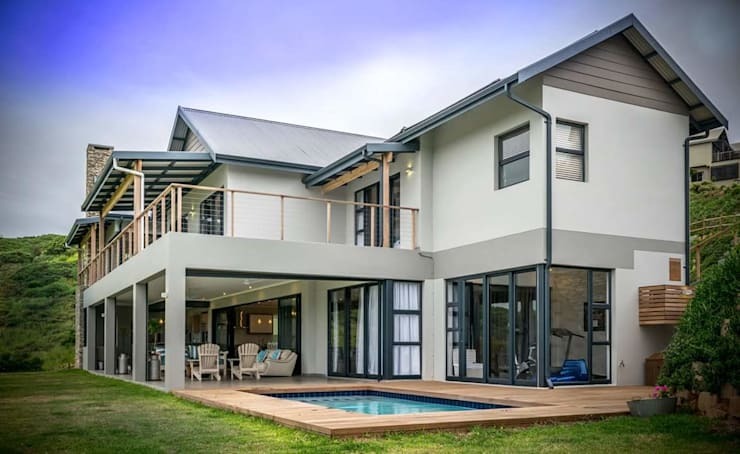 Today, we are going to travel to the southern tip of Africa, to a place called Simbithi Eco Estate, where home building professionals CA Architects created a family home that you can only dream of! Almost 7,000 square feet, this home is wonderful balance between stylish and functional. What is is most striking about this design is how it incorporates the surrounds into its layout as well as how spacious and homely it is. The architects' rightly describe it as an entertainer's dream. From the get go, we can see just how modern and luxurious this home is. The two storey structure extends over a large piece of property. The upstairs and downstairs areas both spill out onto large and spacious terraces. Large glass windows and doors allow for a seamless transition between the interior and exterior spaces. The simple grey tones of the facade and the stone cladding throughout make for a very subtle yet appealing look and feel. It also integrates the home flawlessly into the surrounds. If we take a closer look, we can see how the terrace features a gorgeous little swimming pool. For the warm, summer months this is perfect for taking a cool dip or playing games with the kids. 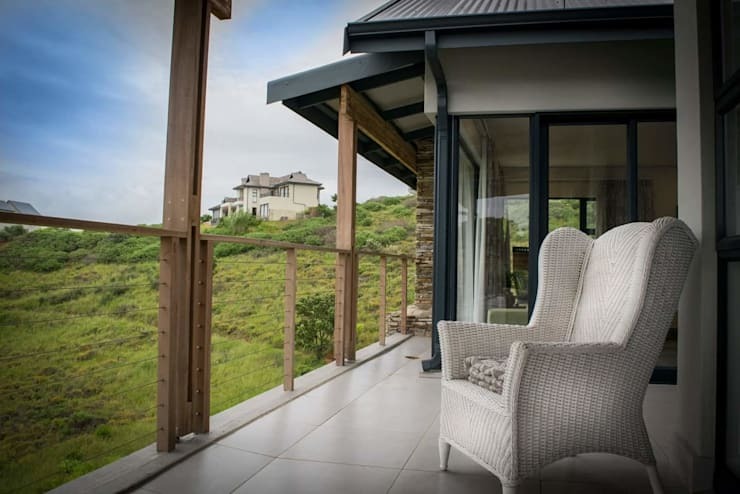 The covered terrace features comfortable and cozy furniture where the family can relax in the warm air and enjoy a good book or entertain friends. We also really get a sense of just how expansive the property is from this image. 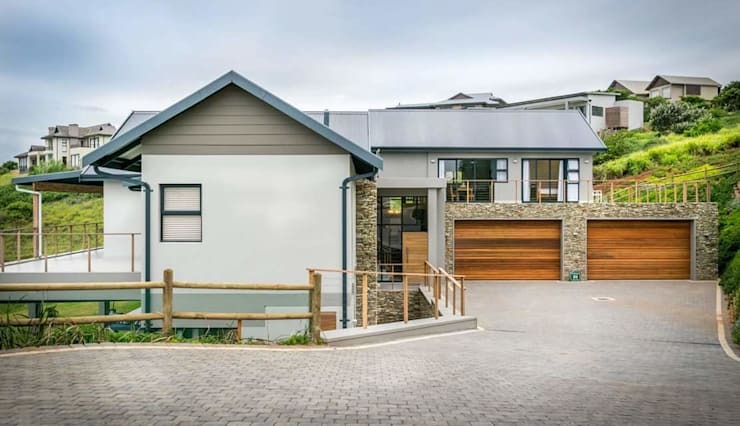 The entrance to the home is slightly more private than the back of the house, yet thanks to the double-height window that encases the wooden front door, we get a little glimpse into the home! A brick driveway leads up to a double-garage, which adds another wooden element to the facade. These wooden doors work in harmony with the stone cladding and smooth, grey walls. This creates a wonderful balance between the contemporary and the rustic. Don't you love how the designers have molded the home into the landscape here, playing with height and space? The open plan home features beautiful and cozy furniture, enveloping the family in its warmth, style and comfort. The living room features simple furniture including grey sofas and a wooden coffee table, however the patterned cushions and the plush rug bring that sense of luxury and warmth to the room. 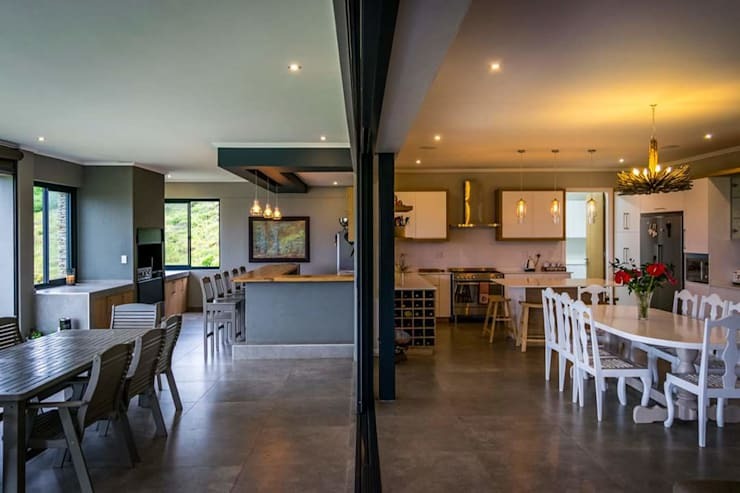 We can see how the living room spills into the dining room as well as how the interior spaces connect seamlessly with the exterior living spaces. This makes for a very spacious home! In fact if we look at this image, we can see how simple glass sliding doors are the only things separating the interior and exterior spaces. The floors match, which adds to that spacious and expansive look and feel. This is a great design tip, which creates plenty of functional and comfortable spaces for the whole family. The outdoor area features a dining area, a bar and a barbeque too. What more could you need? If we have a closer look at the bar area on the terrace, we can see how much attention has been paid to the detail of the home. The L-shaped bar features wooden counter tops and grey cabinets, while grey bar stools line up alongside it. Three drop down lamps bring a sense of warmth and charm to the area while a cabinet on the wall holds glasses and other items. A simple piece of artwork injects this area with character and personality. 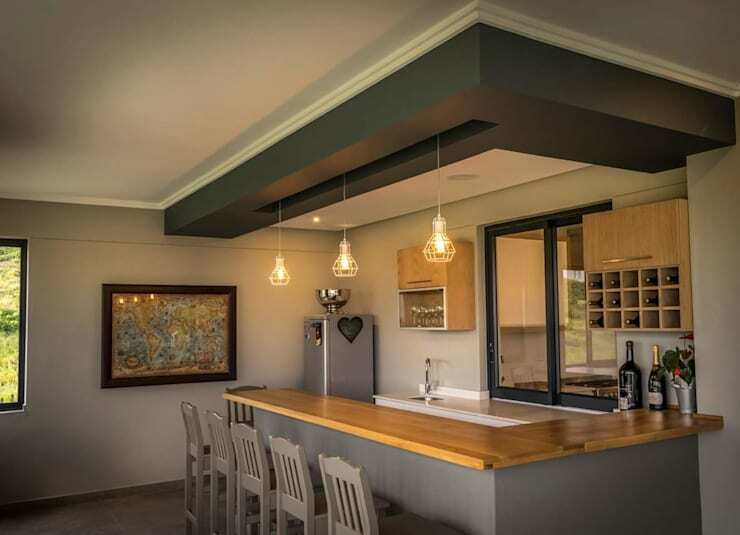 If you are looking to install a bar in your home, have a look at this article: 10 fabulous and original ideas to incorporate a bar in your home. The upstairs balcony is slightly more private than the downstairs terrace. It features some simple yet stylish and cozy outdoor furniture, such as this gorgeous armchair. This is the perfect space for admiring the panoramic views. Couldn't you imagine sipping your coffee here before you start your day? This home is a true inspiration and one that many families dream of! 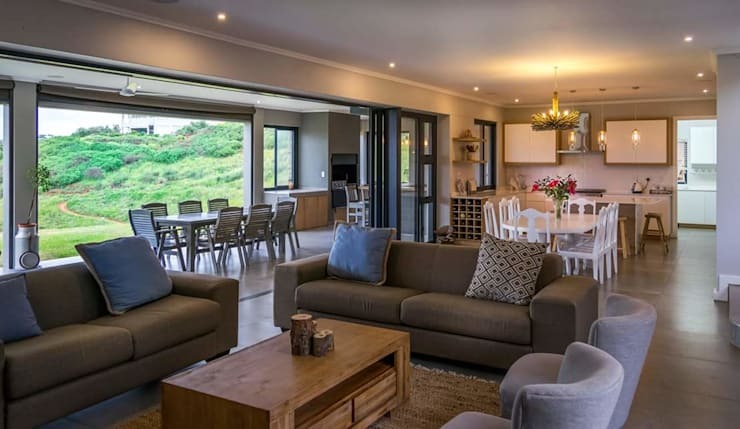 If you've enjoyed exploring this South African home, have a look at this article too: 5 pictures of sensational South African homes. Also be sure to check out these 14 pictures of dream homes with their plans. Are you inspired by this South African home?